Sørg for en jevn og stressfri start på cruise ved å forhåndsbestille en delt avgangstransport til Southampton cruiseport. Din sjåfør vil hente deg fra ditt sentrale London-hotell eller privatbolig, hjelpe med bagasjen din, og kjøre deg til Southampton-cruiseterminalen av en komfortabel offentlig transportør. They pick you up on time. The ride was smooth and easy. Highly recommend this service. The driver was about 30 minutes late so I had to call to make sure that they hadn't forgot us. The driver said he was late due to the traffic and the company should have called me. This was my only complaint, otherwise he got us to the ship in plenty of time. Best way to transfer!! Driver was wonderful - would book again! Pick up at hotel dead on time. Unfortunately due to road closures and resultant detours our transfer extended to nearly 3.5 hours. Courteous driver. Safe driver. We only had 4 other people in Mercedes mini van. Easy and economical way to get to the cruise port. Excellent driver. On time and excellent drivers. Confirmed the booking and pickup time - then had a call back from the provider saying the ship was late and our pickup time was put back an hour - we had heard anything from the cruise company and I've never know a ship to be only 1 hour late getting in - anyway - it was left that we would be picked up at the original time - low and behold the no one has arrived to pick us up - ring the provider and we're back to the 'story' that the ship is late and we had 'agreed' to being picked up later - not so and not happy - when the driver did arrive he stated he did not received advice regarding the job until 1041 - our pick up time was 1030 - then the driver tells us he his last job was an arrival from the same terminal in Southampton - how about that for a coincidence - NOT AT ALL HAPPY - if I am paying for a service, I expect service, not at the convenience of the provider. The driver was on time in a luxury van. We were a group of 4 adults with 10 bags. 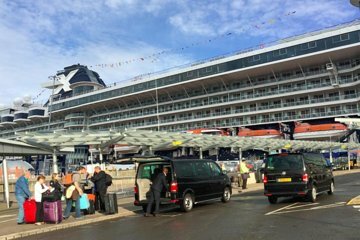 The van dropped us off right in front of the cruise ship embarkation facility. The drive from our hotel in Paddington to the Southampton cruise port was two hours. Our driver was excellent! He was very friendly. When we wanted to talk, he talked to us, and when we wanted to be quiet, he was quiet as well. It could not have been better.